Twelve students from under-represented groups are being groomed as potential public health nurse leaders, with the hope that they will eventually return to their communities and educate people about health issues, improve community health and safety, and increase access to care. These students comprise the first cohort to enroll in the Building Undergraduate Nursing's Diverse Leadership at Emory (BUNDLE) program, courtesy of a $970,000 Nursing Workforce Diversity grant from the Health Resources and Services Administration. 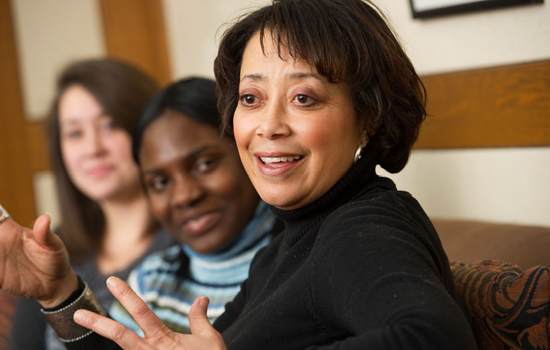 The grant to the School of Nursing is designed to build nursing leaders for underserved populations by increasing nursing education opportunities for students from disadvantaged backgrounds. Emory is one of 12 nursing schools in the country to receive this competitive nurse-training grant and will eventually recruit a total of 45 students into its BUNDLE program over the next three years. A major focus of BUNDLE is reducing barriers to enrolling and retaining students. It provides stipends, scholarships, and mentorship and networking opportunities for racial, ethnic, and economically disadvantaged minorities who are under-represented among registered nurses. "With the changing demographics of the U.S., it's important that the health care provider population mirror the general population and that all providers are trained to provide culturally sensitive care," says Angela Amar PhD RN FAAN (shown above), program director and associate professor. "Our program aims to address the increasing diversity and health disparities in the populations we serve," she adds. "This diversity increases the richness of the patient experience, not only for these students but also for every student who will have to interact in our diverse world."